When it comes to choosing perfume, sometimes the perfume bottle can actually sway you towards making that purchase rather than the scent itself! Luckily, Marc Jacobs perfumes not only have delicious scents but also come in super stylish bottles. Here at TJ Hughes you will find all of your favourite Marc Jacobs bottled beauties, all at amazing value prices! Sure to make fine additions to any dressing table, each Marc Jacobs perfume features its own distinctive scent along with a truly unique perfume bottle – they’re as much accessories as they are perfumes! A fragrance favourite by leading fashion designer Marc Jacobs has to be Daisy. Marc Jacobs Daisy perfume is presented in a truly girly bottle, complete with cute little daisy detailing on the lid. The scent itself is a light and enchanting lend of fruity and floral notes. For the ultimate centrepiece to any perfume collection, look no further than Marc Jacobs Oh Lola perfume. A flirtatious and charming fragrance, Oh Lola is a presented in a sophisticated bottle which is in the shape of a flower. 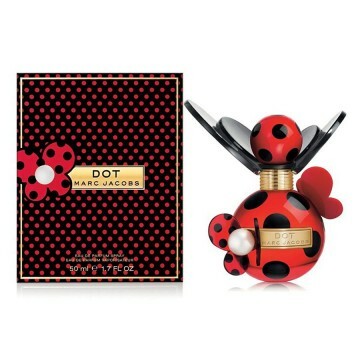 Fashionistas are sure to love Marc Jacobs Dot Perfume. In a fun ladybird red bottle, the polka dot design of the Dot perfume bottle takes its inspiration from Marc’s own love of this iconic pattern. Men needn’t miss out on the style and class of Marc Jacobs fragrances as here at TJ Hughes we also offer Marc Jacobs’ popular aftershave fragrance: Marc Jacobs Bang. This men’s fragrance is presented in a smart and sophisticated ‘smashed’ effect bottle and features an energising and youthful scent certain to appeal to any style conscious male. Update your fragrance collection by shopping cheap perfumes and men’s fragrances by browsing Marc Jacobs fragrances online at TJ Hughes.